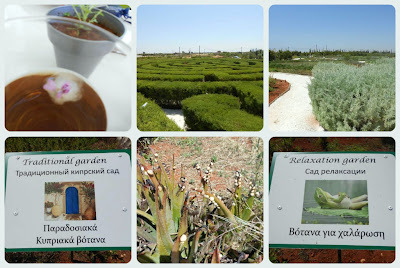 Today we had a brilliant, 'amaze-ing' in fact day out at CyHerbia Organic Herb Gardens in Avgorou.. I'd only recently found out about the place via facebook and today they had an Easter Egg hunt in the maze. 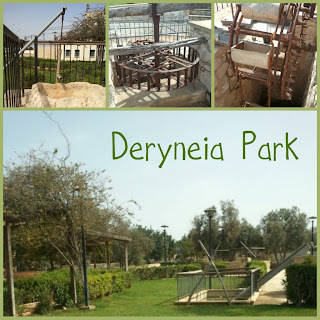 CyHerbia has 9 themed herb gardens, woodland and Cyprus' only elevated hedge maze. It has a distillation room which although we didn't see today demonstrates the process of essential oil distillation and a tea room where you can sample the herbal teas and see the many herbs, and herbal products available for sale. Today was a special Easter event (no, they are not late with it, we celebrate Orthodox Easter here in Cyprus so Easter weekend is next week!) and for €2 per child you could take part in an egg hunt in the maze, 'I-spy' in the herb gardens as well as some sheets to complete finding other things in the maze and spotting the Easter bunnies hiding in the gardens. Leo's current favourite thing is wii sports, and annoyingly is better than me at mot of it! Tuesday we went to a St George's Day celebration at a local pub/ hotel, they had a bouncy castle but Leo and his friend also went in the pool for the first time this year, this is Louka watching from a nearby sunbed. Louka tries broccoli, sweet potato and chicken and rice for the first time and I also get Leo eating it too after making a chart to go on the fridge - each boy gets a star for trying a new food. As Leo doesn't like to lose he has to try as much stuff as Louka does, which obviously works to my advantage as Louka will eat anything still... vegetables, plants, magazines, anything he can pick up really! Getting ready to go to my Greek lesson and my Mum comes up to babysit, she gets roped into board games and tries to learn Leo's rules which change all the time! Louka now wriggles off the playmat and prefers to get under it! Last year Aaron started work in Easy Riders hire shop in Agia Napa, as they are only open during the summer season they work very long hours and so I often took Leo down to see his Dad during the day. He loved sitting on all the quads although always made Aaron promise not to start them as he didn't like the noise. Last week I took both the boys down to see him and Leo couldn't wait to get on the quads again. This year however he is much braver and actually wanted to go out on one! He was very happy that Daddy took him up the road and back and he loved every second. Louka was in a very wriggly mood so I didn't get round to getting his photo taken on one but I'm sure I will next time. 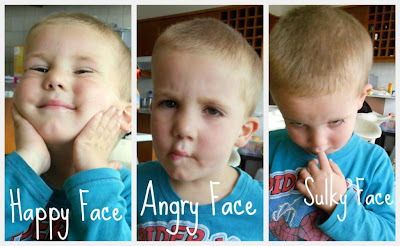 Two years ago I published a blog post 'The many faces of Leo' where I had a series of photos of him pulling different faces for me, so when I saw this weeks Gallery theme was expressions it was the first thing that came to mind. I showed him the original photos and the blog post and explained that I wanted to write a new one and he was very happy to oblige, although he had to choose the faces he made this time! Leo does love 'the park with the statue' and we often go there either on our own or with a group of us. 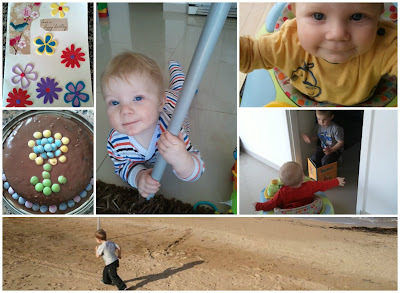 a couple of weeks ago I left Louka with Aaron and took Leo on my own for an hour or so. He paid more attention than usual to the water pumping displays and I had to figure out how they all would have worked to explain them all to him - it's a shame they don't have some information boards next to them as that would have made it much easier. As usual we also collected pine cones for Nana, she asked him a while ago to see if he could find some for her, soon I think she won't be able to move for the amount he's been giving her! It will not last the night. But ah, my foes, and oh, my friends, It gives a lovely light. My Dad grew up with his Dad telling him not to 'burn the candle at both ends' and he often said it to me too. Although I quite like the quote now at the time it drove me mad! Then I thought it a load of rubbish and decided that I'd rather pour petrol on the bloody candle and have a huge flame - that sounded much more fun! The thing is, a youthful candle is much longer lasting! This is one of my all time favourite photos of me, although my Mum hated it! It was taken in 1994 in Minorca on my last holiday with my parents. I loved that dress although I didn't ever have the confidence to wear it anywhere other than on holiday. Not sure why looking at the photo, I wish I'd realised I was that slim at the time! 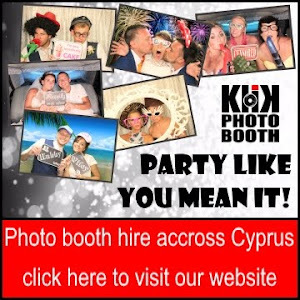 Name days are not something I had heard of before moving to Cyprus but as I love any excuse to celebrate I thought it best to try and embrace the local tradition! 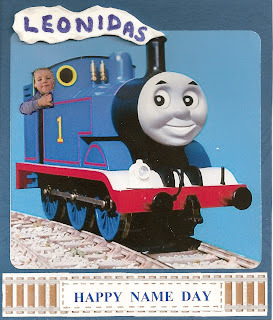 In previous years Leo has had no idea of it being his name day as he was too young too understand, even birthdays were not really understood, but this year I knew he would appreciate it more. At school he often receives a small chocolate or sweet from various children as they take them to hand out on their respective days. Leo was very excited to take in a bag of mini chocolate bars to hand out to his teachers and friends, and even more pleased to get two of them himself! This month sees the start of the so called 'Silly Season' here in Cyprus, the tourist areas are waking up after the winter shut down. Protaras, which almost completely closes during winter has opened again and pretty much everything in Agia Napa is open again for the summer. Last week Aaron started work again and all of a sudden we have a big change upon us. Last year was his first season and I was worried about coping through the summer with Leo and my ever growing baby bump, not to mention the arrival of said baby bump and the first couple of months with dealing with two children. Once the season gets underway he has to work 7 days a week, often in the height of summer for up to 12 hours a day, and he got just one day off when Louka was born. It was a long old summer! Then there was trouble! Now Louka is moving about he keeps grabbing Leo's things, this is not going down well, especially when he removes bits of track! On Tuesday I had my first parent's morning at school. He's doing so well and I'm so proud of how well he is coping with the second language. After telling Leo how proud of him I was doing so well at school and with his Greek he decided he wanted to help me learn too so he got his puzzle out and started teaching me! A rare moment of Louka sitting upright, propped up with cushions. He usually throws himself about as he prefers to be held standing up, which is really hard work on your arms! Revision for today's Greek exam! It's not all Greek to him! 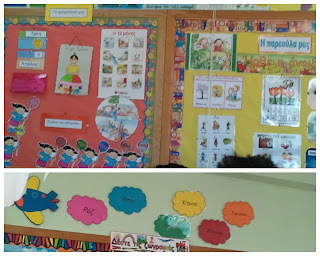 If you've been reading my blog a while you will no doubt remember how worried I was about sending Leo to school, from trying to work out where to send him, and how to enroll to his first day at his 'big school' it's been quite a concern of mine. Although he seems to have enjoying his time at his school since September I had wondered exactly how he had been getting on, he always says he doesn't remember when you ask him what he's been doing and because of the language barrier he often can't explain very well even when he does remember! Today the parents were invited to spend an hour in the class and then to enjoy coffee and cake whilst having a chat to the teachers about the children's progress. Last week I didn't get a chance to post my photos and I missed the linky for the first time but I still managed a photo a day! It was my Mum's birthday last week hence the homemade card and cake from Leo and myself. Louka has now mastered getting about in his baby walker, including an obsession with trying to get into Leo's bedroom. Leo is not impressed about this new development and I found him sitting on his stool in the doorway blocking Louka's entrance! Louka has almost got his first tooth, not that there is a chance of him showing anyone so certainly no photo! 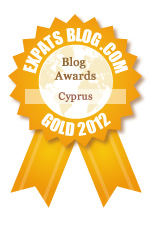 Despite many sleepless nights (nothing new there then from him!) he's still been his very smiley happy self during the day. This week I got my 1 stone award at Slimming world, we've been exploring our local park again, Leo has been bowling for the first time and today Leo and I had our first proper beach trip of the year - blog posts to follow when I catch up with myself!